Lesson Of The Week: Doubles Or Singles? 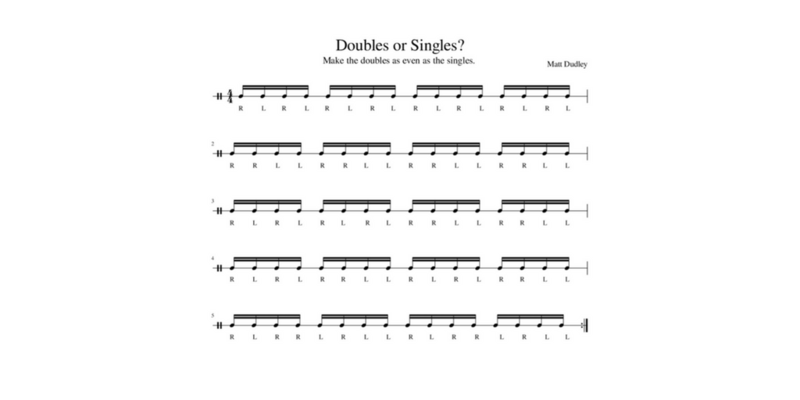 In this lesson we are taking a simple concept of singles and doubles and trying to create and even sound and feel even though the patterns change. The object is to make the doubles a chameleon if you were just listening. Visually you can see the difference but you want to keep the sound as if they were singles. Focus on how the singles feel compared to the doubles. Try to increase/decrease pressure between the two until they both feel even. Stick heights should be bigger at slower tempos with the sticks rebounding. As the tempo increases the heights will adjust and lower. This is the final product after feel. Be patient and relax as you are playing this exercise. Focus in on the sound of each stroke trying to match the two groups as close as possible. The quality of sound is produced not only from the technique and feel but from just listening so that you can adjust. Your body will tell you what needs to change as you progress. Get a metronome or a metronome app and set the note value to 16th notes. By doing this you will be playing every stroke on every “beep” creating perfect strokes in time. This will help at higher tempos building a solid foundation. Start off at 60 BPM and slowly work on the mechanics then increase by 10 BPM once you are comfortable.